Species description: Large 30-35 ft Herbivore that was a favorite target of TREX 18’ tall with flat-head and a toothless beak but behind beak many rows of teeth with a long tail like an Iquanodon and was a herbivore. 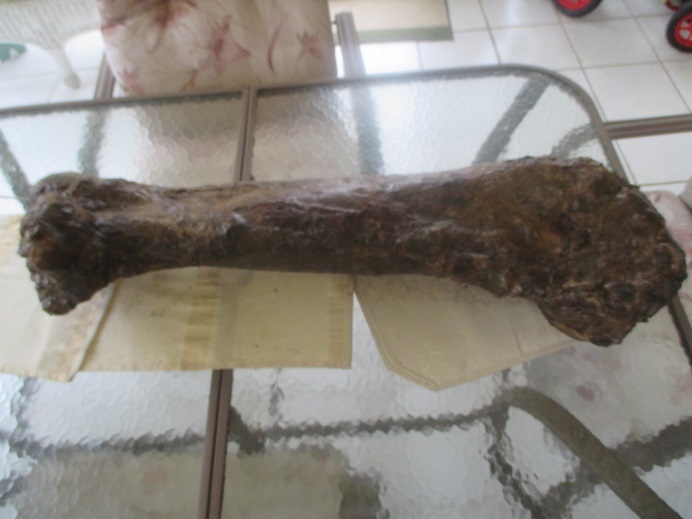 Item rating and description:1-10 8.0 This piece is for someone who doesn’t have 4000 for a top premium large bone, but has much less than half that to invest and get a good representation of a great dinosaur. The bone quality is not top premium, however size, and originality are wonderful. The shape is good, however, the ridge of the edmo is partly absent. The great thing is the bone was never broken all the way thru .Partial pieces that were horizontal were broken off and restored to original luster but the prize is one never broken thru vertically so this showed a lot . 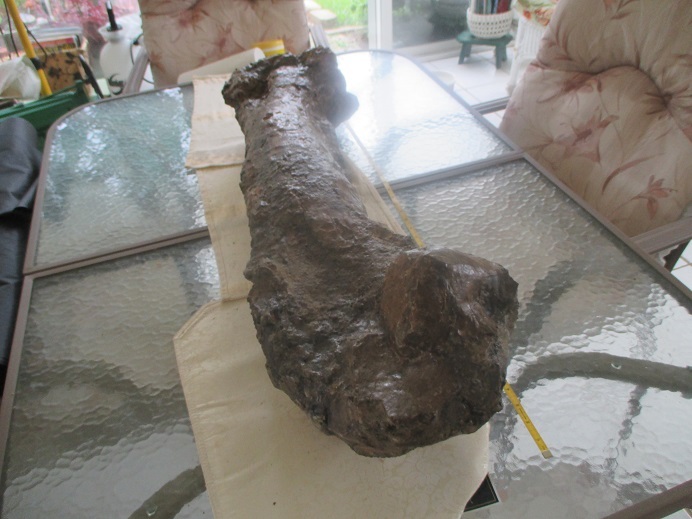 It was very unstable at first yet still it never broke but I used loads of penetrant sealant on both sides which go thru the bone entirely to make like rock. This femur had some reddish spots intermixed with Hell Creek brown. 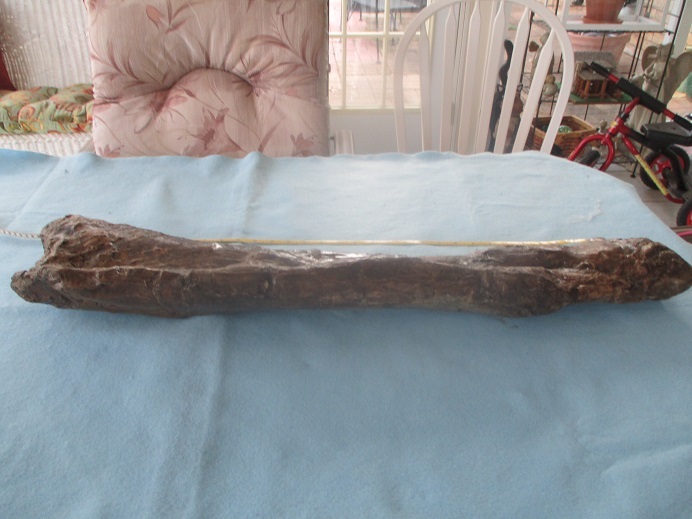 Even though it is average at best bone it is a great way to get a big one that has many crack fills and a few spots of restoration at a super price. 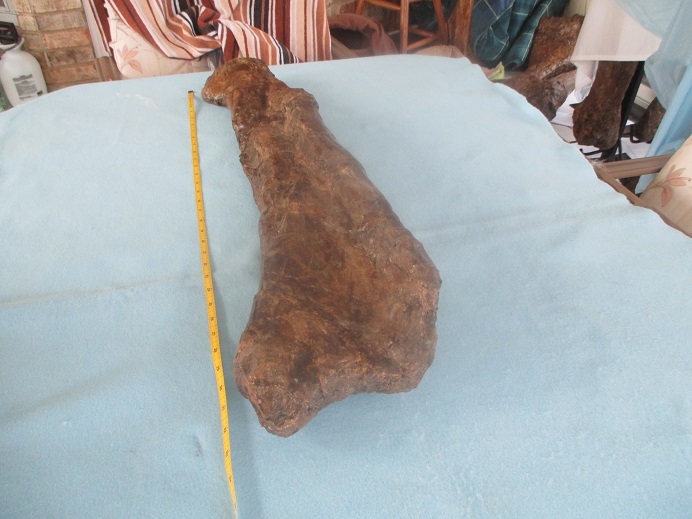 It basically has the end outcroppings exhibited on shape .This is such a huge femur for the money. I have better quality ones for 3800 at site so if you want great ones pay much more. If your on a budget, and you can buy on time with a 20% deposit at full price also as long as paid in 6-8 months - this is the one for you. It is very transportable in foam as I pack well in foam and a crate so it’s safe to ship, and should deliver fine with no large breaks. 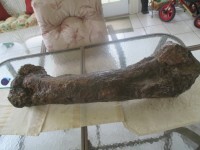 The bone is a beautiful reddish dark brown color, and the shape of both ends is simply remarkable. Anyway it is so special it’s a site to behold so let the pictures do more talking. No stand on this to cut your expenses on this. 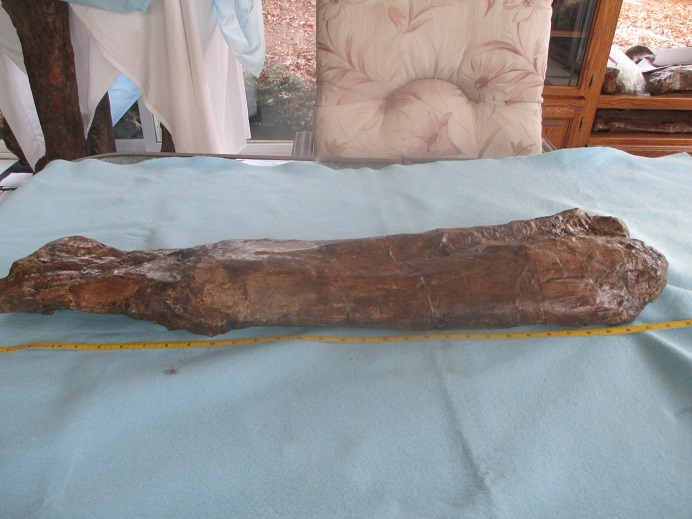 These femurs go for large dollars over 5000, but I’m reasonable for this size which is extremely large. Check out this reduced price. Species description: A Duck-bill herbivore dinosaur who roamed the plains from 70-65.5 MYA . 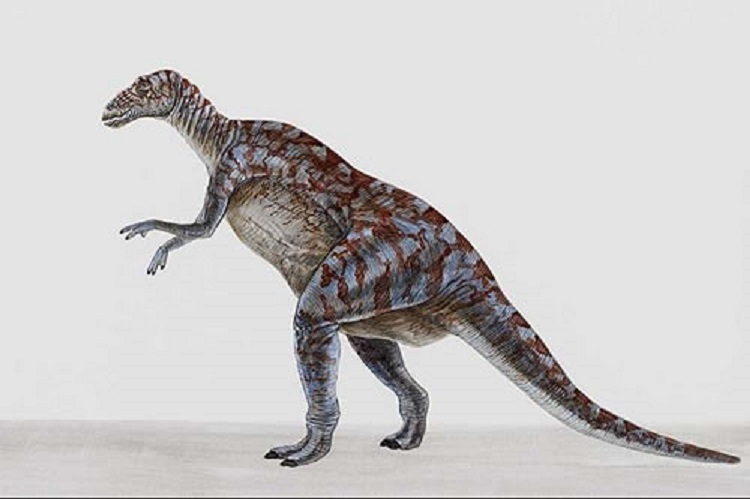 Species description: Large 50 ft Herbivore that was a favorite target of Albertosaurus with a hollow hatchet shaped crest jutting forward from a skull roof and lived before Edmontosaurus. Item rating and description:1-10 -9 Due to rarity Pretty Brown Colored 33” Long Lambeosaurus Tibia from North Montana .This is a fine piece with wonderful color, structure, and bone quality. 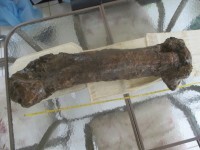 The color is brown but has a spec of cinnamon due to a Judith River find which is much earlier than the normal Edmontosaurus . 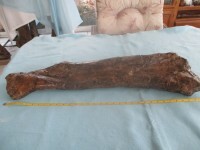 These are quite rare not like edmontosaurus so for someone who wants a rare nice bone inexpensive It is a rarity because this species is only found in one small area in Montana in the USA as it’s mainly found in Canada. For people who know how hard this is to get here is a great price and it’s only my second ever, and a chance to get a rare piece at a very, very low price. It was broken once but glued back and prepped well with hardly any resto at all, just crack and spot fills. It’s so great only pictures can show you just how much. You will not have another chance to get this specimen ever again as I never saw one for sale except one I had that sold quickly .Its heavy bone and 99% original . Item rating and description: 1-10 9.5 Wow -You just don’t see this-15 Pieces of quality bone put together from various animals to form a foot . That’s the only way you can get a complete foot. 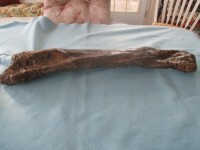 Pieces are original with only a little restore on the larger metatarsals . Most have only crack fills . 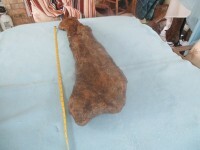 The quality of bone overall is excellent . The metatarsals Id say very good. 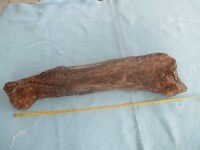 While bones are intermixed they are accurate in placement as Ill send pictures. There are various left, right pieces throughout that atre mostly Hell Creek Brown some darker others lighter . 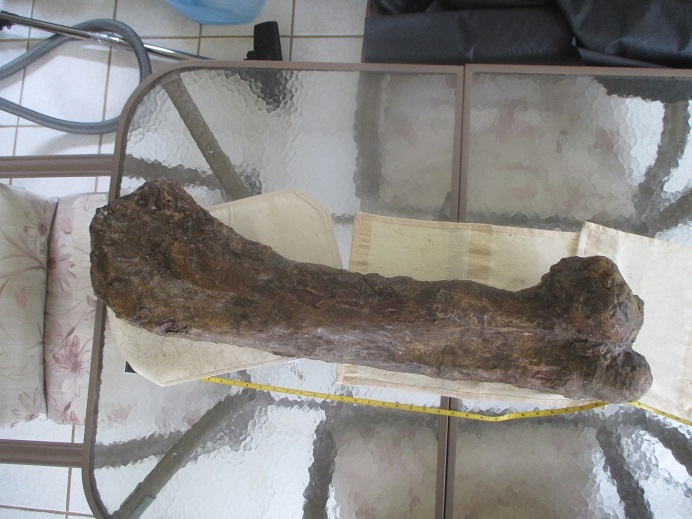 The size indicates the giant Edmontosaurus species, but some could be a huge annectus. 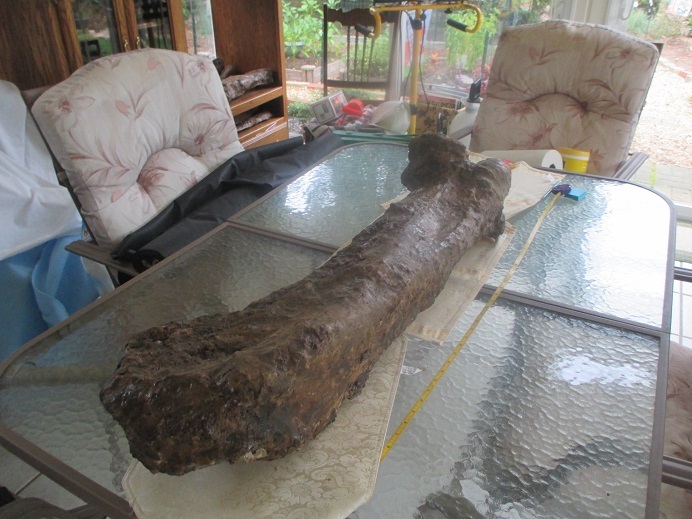 The hooves huge at 4 x3.5, 5x4, and 4x4 inches all from one dinosaur. The hooves are the best I ever saw with no restore only crack fills. These also have detail which is amazing and it looks like this animal had arthritis so makes this very valuable. 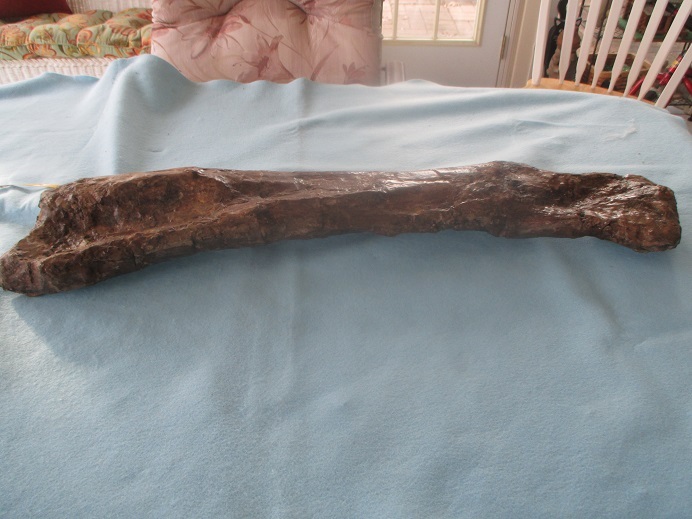 This piece has 15 Bones & 6 of them are from the same dinosaur. This is 99% Original Bone overall . This is better than a normal museum specimen and a picture will come with purchase to place them right in the foot. I also took pictures of underneath to show you quality of bone which are towards end of pics. Most feet are total composites from many animals but not this one. To give you an idea of how rare this is only a few complete edmontosaurus hadro feet have been found and they are almost always annectus species. The Hooves are actually so close to perfect on size, shape, and quality . This is such a find as this takes years to come up with a whole one , and this took me 3 years . . This is a real treat for something rare for one’s collection. It is highly natural with little done to it and has great shapes, color, detail on all bones. The total quality is what draws you to this. I figured out what I HAVE IN THIS PIECE AND IT WASN’T MUCH UNDER what Im asking . Look at these pics. I decided to sell at much lower price(about $1000) than I have for the few I’ve gotten in 15 years for quick sale .